At Venture Ski we try very hard to deliver what you want, so we offer no fixed transfer days or times where possible, to allow you to travel when it suits you. We cater to specific dietary requirements including ceoliac, but allergy, dietary intolerant and of course vegetarian and vegan. We are also very flexible with options for catering. You can book accommodation with us as exclusive-use or larger chalet lodges where you can reserve a single en-suite room. We also have chalets reserved for B&B or self-catering. In the Black Diamond Lodge (our boutique hotel) the rooms are offered as bed & breakfast with optional use of our #1 rated restaurant. Price reductions may apply for empty beds. 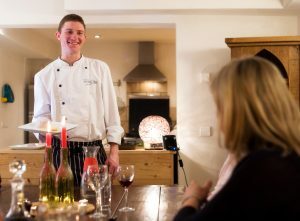 If you have a smaller party and don’t fill a chalet, but still would like exclusive use and your own chef/chalet host, please contact us for details. Similarly a larger group or longer stay may qualify for a pro-rate price reduction. Ask for an exclusive quote HERE, direct to guest.services@ventureski.co.uk, or give us a call on +44 207 558 8278. Also, look at our News and Offers page for codes to quote in our on-line booking systems. Finest cotton linen, fluffy towels. Hypoallergenic duvets & pillows. Complimentary toiletries including shampoo, soaps & hydration cream. Use of our spa/swimming pool, sauna and outdoor hot tubs. Access to our Venture Ski facilities such as crèche, resort hosts/concierge service, on-site massage therapist. If you need a little help with the catering, we can arrange a drop off service for fresh breakfast supplies each day (Croissants, bread, milk, fruit juices. Prices will depend on numbers and selection). Similarly, you are just a few metres from our top rated Black Diamond Lodge Restaurant, where you can book in for dinner on an ad-hoc basis, or pre-book at a fixed price prior to your holiday to be assured of a bit of a treat in the evenings. Venture Ski’s catered ski chalet portfolio and service has been developed over many years in Sainte Foy to offer you a relaxing, luxurious stay during your holiday. Your family or group will truly enjoy the catered chalet experience. Venture Ski provides the benchmark for accommodation and service to which other ski companies aspire. We believe we offer the finest of Sainte Foy Catered Chalets – please come and see the difference. There are also bars, shops and restaurants within five minutes’ walk from the chalet door.